ACS: Awesome Iphone Shooting Games. Beat off your friends with these! Awesome Iphone Shooting Games. Beat off your friends with these! So you got your iphone 4S, and things are looking up. There are so many awesome things you can do with it! APPs! Facetime! Flipboard! itunes! So much stuff! When will you finish, how will you ever get through all these apps? You wont... But you can finish your friends off with one of these new augmented reality shooting games, and guns. 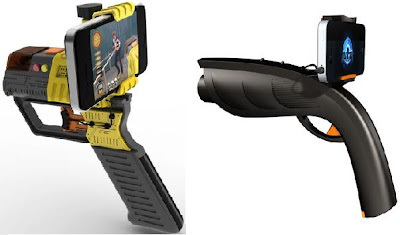 The XappR, and AppTag are two app driven gun accessory based games soon to be released. They have caught our eye, and seem very cool. Check below for more info. The XAPPR is being called the "Ultimate Gaming Accessory for your smartphone." From what i've seen it may hold the crown. The XappR looks like a fun, socially stimulating game system that works on multiple operating systems. It will be compatible with iPod, iPhone, Android phones, and Windows phones. The 4 games they currently offer look simple, and addictive. They are priced at .99 cents each on itunes. The XappR itself is available for pre-order for about $29.99. Release date set for June 2012.